Tottenham hosted Chelsea in the premier league game on Sunday at Wembley Stadium and it turned out to be a classic london derby. Chelsea under all kinds of pressure before the game started the match stronger and took the lead thanks to Marcos Alonso freekick. After that Spurs dominated the game but failed to score with Harry Kane coming close late in first half when he hit the woodwork after fine cut in and shot. Chelsea hanged on to their lead for most part of the second half. 24′ 0 – 1 Marcos Alonso scored a stunning freekick to put defending champions Chelsea in lead at Wembley. Last time these two meet was back in May 2016 when Chelsea came from behind to draw the game 2-2 which resulted in handing the title to Leicester City with a game to spare. Tottenham are coming into this game on the back of a terrible result against AS Monaco where 2-1 defeat eliminated them from the champions league and they will be eager to put a better showing against Chelsea on Saturday. Chelsea overpowered Tottenham in the last meeting between the two clubs back in April 2017 when the beat Spurs 4-2 at Wembley in the FA Cup semifinal. 05′ 1 – 0 Willian scored with absolute peach of a freekick to put Chelsea 1-0 up in just 5th minute of the match. 18′ 1 – 1 Harry Kane equalized in 18th minute with a great goal. 43′ 2 – 1 Willian scores from the spot after Chelsea were awarded a penalty kick for foul on Victor Moses. 52′ 2 – 2 Dele Alli equalized for Spurs again just after the halftime. Last time these two teams meet was back in January 2017 when Tottenham Hotspurs recorded a comfortable 2-0 win thanks to a headed brace by Dele Alli. 45′ 1 – 0 Dele Alli scored yet another important goal to put Tottenham 1-0 up after a superb start by spurs at White hart Lane. Chelsea looked decent but nothing special to suggest their 13 games winning streak. 55′ 2 – 0 Dele Alli was on target again after the break to make it 2-0 on the night. Spurs currently sitting 5th in the table with 24 points and a win against Chelsea will take them just 1 point off the leaders and that is big enough motivation for players to put up good game. However Chelsea will be fresher of the two as they don’t have any european commitments this season while Mauricio Pochettino tweak with his starting lineup. Preview Match Preview: Its been 13 games in the league since Tottenham’s last defeat when they lost to Manchester United on the opening day of the season. Since than they have won 6 and draw n 6. Chelsea on the other hand has been horrific in the league already lost 7 matches and they bounced back from three back to back league defeats when they secured important 1-0 win over Norwich. A win for Chelsea will go along way to ease some pressure on Mourinho. Chelsea are likely to start with Diego Costa in attacking with Pedro, Hazard and Willian playing in supporting roles behind Costa. Matic and Fabregas should play in midfield as Ramirez is doubt for Spurs clash. John Terry is another name who will be assessed on the day of the game to see if he can make it to the starting lineup. Dembele will start with Eric Dier in the midfield as Dele Ali is missing out through suspension. Harry Kane to play as lone striker upfront with Erikson, Lamela and Ki playing in attacking roles. 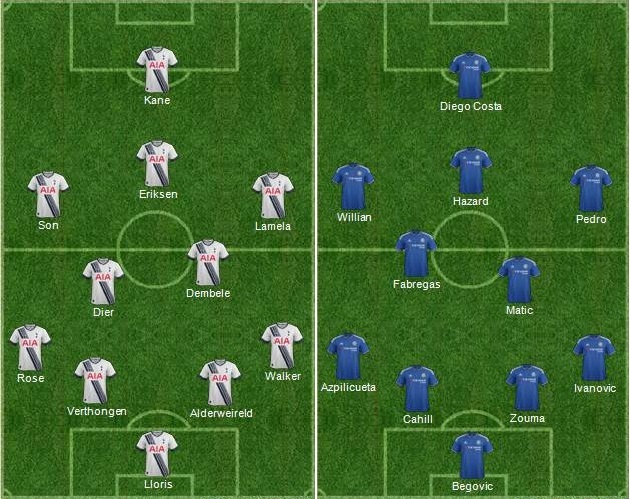 Match Predictions: Spurs has been in such good form I can not see them losing against Chelsea at White Hart Lane. Last year’s fixture saw one of the best game of the season when Harry kane powered Tottenham to 5-3 win over Chelsea. There will be goals in this one and I expect Spurs to narrowly win against Chelsea. Preview Matches Review: Tottenham brisked past Chelsea in the premier league game on Monday to keep their slight hopes of title alive the win reduced the game at top of the table to just 5 points. Harry Kane opened the scoring in 35th minute while Heung-Min Son made it 2-0 just before the break. However Chelsea struck back just after the break as Gary Cahill scored on a lose ball after corner kick routine to make it 2-1 as Chelsea got themselves back in the game. Hazard made it 2-2 on the night as Leicester City confirmed as 2015-16 premier league champions. Tottenham should be tough mentally to beat big clubs.